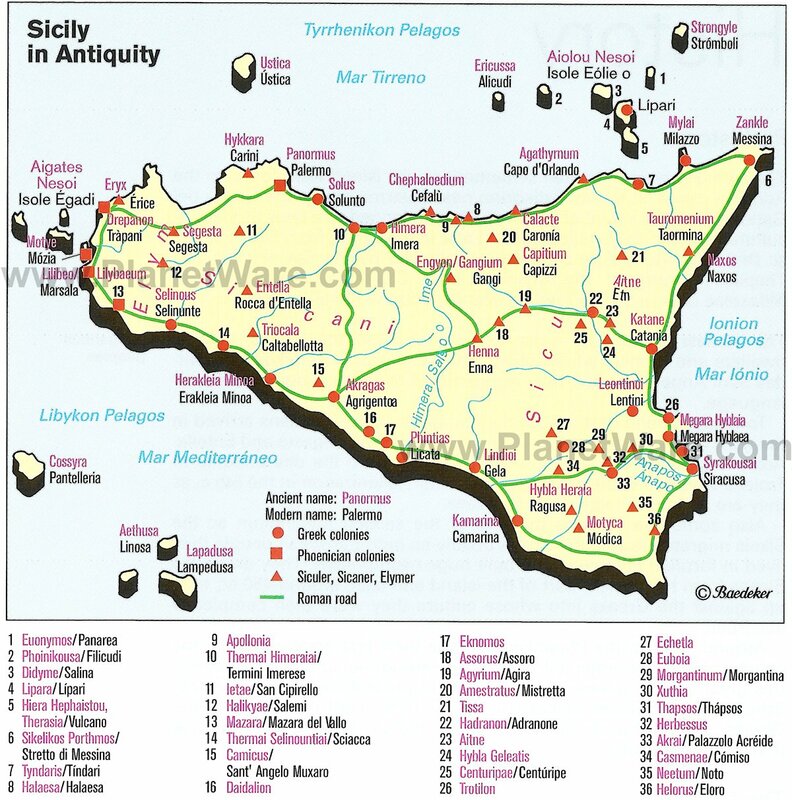 Sicily is full of superlatives, many of them relating to treasures of the ancient world. In Agrigento's Valley of Temples, for example, you'll see one of the three most perfect temples in the Greek world. At Selinunte is one of the largest of all known Greek temples. 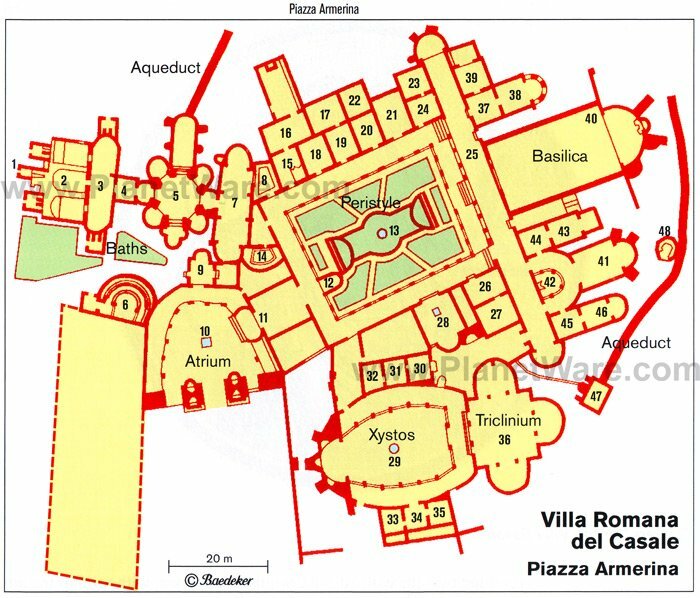 Villa Romana del Casale in Enna, with more than 3,500 square meters of mosaics, is one of the best-preserved villas anywhere in the Roman Empire and now a UNESCO World Heritage Site. So are the twin towns of Ragusa and Modica for representing Europe's zenith of Baroque art. Both the stunning mosaics and the exquisite cloister at Monreale are considered highlights of European art, and the collections at Palermo's Archeological Museum rank it as one of Italy's best. Natural wonders have their place, too, with Mount Etna ranking as continental Europe's tallest active volcano. Beyond its tourist attractions, you'll enjoy Sicily for its lively local culture and spirited people. The cathedral of Monreale reflects at once the politics, religion, and artistic heights of Sicily under the Normans. And in doing so, it also achieved a place in the art history of Europe, all the more remarkable because it remains today almost exactly as it was built in the 1100s. Its architecture represents the move away from Eastern Byzantine forms, but its decoration with dazzling mosaics - considered the church's magnificent highlight -- keep it firmly in the Byzantine traditions. They cover every available surface, in intricate illustrations of Biblical text and themes rendered in vibrant colors and with exceptional artistic virtuosity. Artistically, the cloister ranks right alongside the mosaics, a masterpiece of 228 double columns, with intricately carved capitals, surrounding a garden with a lovely fountain in one corner. The stone carving is not only beautiful, but the motifs are an engaging mix of mythical, religious, animal, floral, and human figures. Many of the columns are inlaid with colored stones, and no two are alike. The large complex of temples and tombs in Agrigento dates as far back as 500 BC and includes Sicily's best preserved Doric temple -- Tempio di Concordia -- one of the most perfect to survive anywhere. 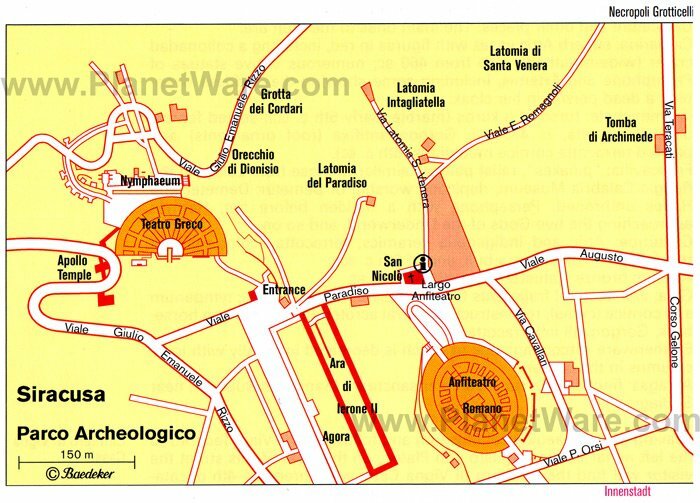 Along with it in the eastern group is the Tempio di Juno Lacinia, almost as large, and in the western group is Temple of the Olympian Zeus, the largest of them at 40 meters but toppled by an earthquake. The circular Doric Tempio di Heracles, also in the western group, was destroyed by the Carthaginians and rebuilt by the Romans, only to be partially destroyed in an earthquake. The entire group is listed as a UNESCO World Heritage Site. Two of Palermo's three major churches, the Cappella Palatina and Santa Maria dell'Ammiraglio, better known as La Martorana, are famed for their mosaics. Those in the chancel of the Normans' court church, Cappella Palatina, are thought to be from 1143 and the mosaic of Christ between Peter and Paul from about 1350. Other highlights of the church are the Arabic stalactite ceiling, the pulpit on carved and inlaid pillars, and the tall candelabra. La Martorana's beautiful mosaics are also from the 12th century on a gold ground and are the oldest of their kind in Sicily. The image of Christ is the centerpiece, and elsewhere in the vaulting, dome, apses, and narthex are scenes from the New Testament. The third church, the cathedral, is worth visiting for its 1453 Gothic-Catalan portico, monumental Norman tombs, and jewel-encrusted crown of Constance of Aragon in the cathedral treasury. One of the largest and most significant of Sicily's ancient sites, Selinunte has eight Greek temples dating as far back as the fifth century BC, plus the nearby Temple of Demeter. The most important are those known as the Eastern Group, labeled by letter: Temple G for its impressive size and Temple E for its architectural grandeur, considered the highpoint of the Classical period. Temple G, now in ruin, was among the largest of all Greek temples. In a separate section is the large Acropolis surrounded by defensive walls, some dating from the seventh century BC. 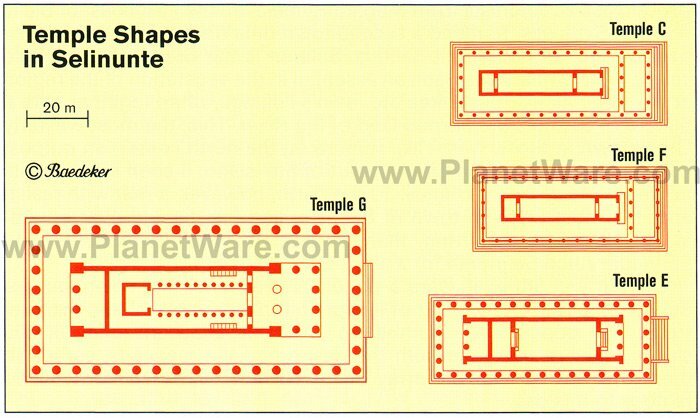 Temple C is the largest and oldest, from about 550 BC, and sits on the highest ground. 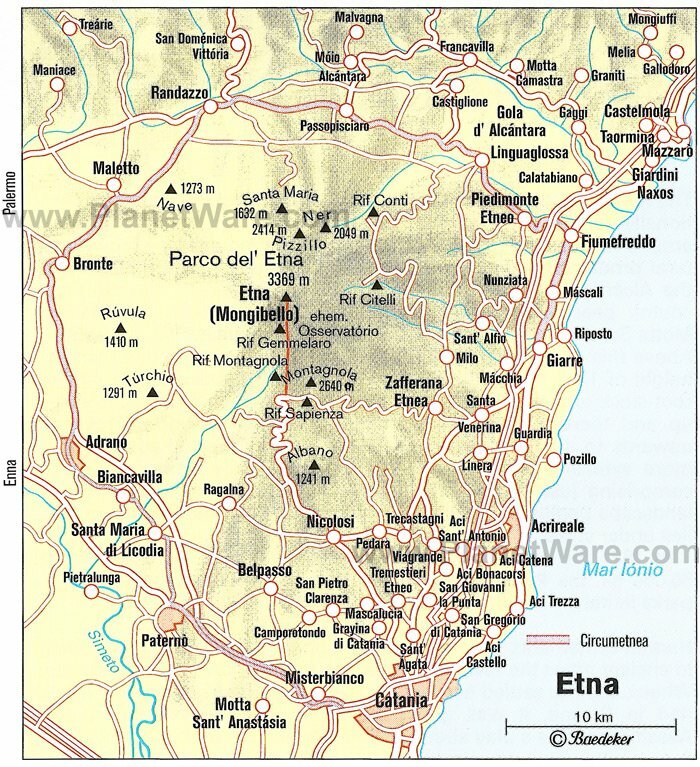 Etna is an enigma; even its height is never certain as it changes with each new eruption. But at more than 3,000 meters, it rules the skyline with its often-smoking cone. Volcanic vents, fumaroles, hot springs, and lava flows add to its changing landscape, much of which you can explore (although not too close to the central crater) on foot or in all-terrain vehicles designed for traction in the volcanic surface. Roads lead to the base of cable cars, which will take you to the 2500-meter point, an easy day trip from Catania or Taormina. In the winter, you can ski near the summit. A narrow-gauge railway, Ferrovia Circumetnea takes you almost completely around the mountain, or you can circle it by car, through towns with castles, archeological sites, and splendid scenery. Along Mount Etna's northern side, the Alcantara River has cut a spectacular gorge through a long-ago lava flow to create the Gole dell'Alcántara (Alcantara Gorge). A 12th-century landslide buried this sprawling Roman villa outside Enna, thus preserving it almost intact to be discovered and excavated eight centuries later. One of the best-preserved villas anywhere in the Roman Empire, it still has most of the original decoration. In the 50 rooms so far excavated are more than 3,500 square meters of mosaic floors with detailed scenes from mythology and contemporary life including hunting wild animals for use in gladiatorial combat. The thermal baths with their colonnaded courtyard and fountain are especially beautiful. The villa is a UNESCO World Heritage Site. One of the largest theaters in the ancient Greek Empire is a good reason, but not the only one, to visit the archaeological park in Syracuse. The view of the excavations as you approach along Viale Rizzo will give you an idea of their extent, which includes both the Greek Theater and a large Roman Amphitheater. The massive Altar of Hiero II dates from the third century BC, a century later than the 15,000-spectator Greek Theater. The Roman Amphitheater is from the third century AD, and is partly hewn from the bedrock. An interesting feature of this archaeological park is the opportunity to see the quarries where the building stone was cut on site for the various structures. The largest of these is the Latomia del Paradiso, where limestone was quarried since the sixth century BC. One of the underground galleries has such perfect acoustics that it is known as l'Orecchio di Dionisio, the Ear of Dionysius. Competing with mountaintop Erice as Sicily's most beautiful town setting, Taormina would be a favorite with tourists even without its magnificent Greek Theater and its iconic view of Mount Etna. Taormina's streets open into terraces, each one with postcard-worthy views of the sea or mountain. Corso Umberto is the main street, crossing the town in a series of squares and terraces and lined by venerable buildings, smart shops, and open-air cafés. Lanes lead upward, becoming long flights of stairs that lead higher and higher to more viewpoints and a castle. The best-known view, immortalized by painters for centuries, is from the landmark Greek Theater, built in the third century BC by the Greeks and completely rebuilt a century later by the Romans. It is largely intact and used for performances. These seven islands, all of volcanic origin and some still active, lie off the north coast of Sicily and are easily reached by boat from Messina or Milazzo. The best known is perhaps Stromboli, whose pyrotechnics light the sky each night, much to the delight of passengers on cruise ships, which time their departures for the display. The volcanic activity has created beautiful coastlines of rough, craggy rocks, as well as natural attractions -- fumaroles and thermal and sulfur springs - to visit. Water sports of all kinds are another draw for tourists, who find beaches, boat rentals, diving, and scenic boat excursions as well as ferry connections between the islands. Prehistoric sites abound, as do later sites from Greek and Roman periods. In a place so filled with Greek, Roman, and earlier sites, you'd expect to find many impressive museums. And you'd be right. But even among this abundance, the museum in Palermo tops them all, and is one of the finest in all Italy. Among its highlights are the Palermo Stone with hieroglyphics listing Egyptian Pharaohs of the third and fourth millennia BC, a colossal second-century BC statue of Zeus, and the outstanding sculptures and friezes from the temples at Selinunte. Look also for the Etruscan Mercury staff, grave carvings from Chiusi, Attic grave-reliefs, as well as Stone Age and Copper Age tools and vessels. 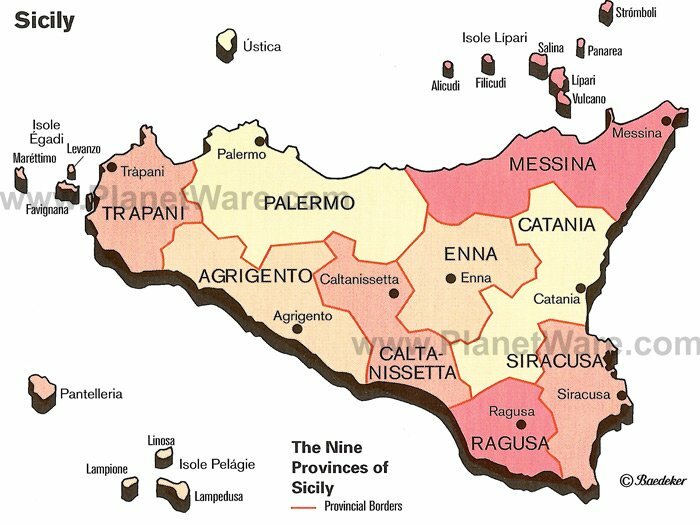 The earthquake of 1693 leveled much of the southern tip of Sicily, including the neighboring towns of Ragusa and Modica. Both towns were rebuilt in the then-current Baroque style, with local interpretations that became known as Sicilian Baroque. Along with six others, Ragusa and Modica were named a UNESCO World Heritage Site as the "culmination and final flowering of Baroque art in Europe." Ragusa built a new town on a hill above the old one, but enough buildings were left in the old town for it to remain active, with new Baroque buildings replacing fallen ones. Modica, too, is built on two levels, and its upper town is highlighted by the Church of San Giorgio, built with materials recovered from fallen buildings after the earthquake. In the lower town look for the 15th-century Gothic rose window in the Chiesa del Carmine. One of Sicily's most interesting medieval buildings, the imposing cathedral was built, so legend has it, by the Norman King Roger II as a votive offering for surviving a storm at sea. The cathedral is a Sicilian history book, with architecture and decorations reflecting almost every wave of conquest in the island's history. Look for Arab, Greek, Roman, Byzantine, and Norman elements. The semi-circular dome of the apse is filled by a mosaic of Christ by Byzantine artists, among the best-preserved mosaics in Sicily. Along with the mosaics, look for the baptismal font from the 12th century and for the highly ornamental plasterwork in the choir.